NEWPORT NEWS, Va. — After years of delays, billions of dollars and tons of sweat, the new aircraft carrier Gerald R. Ford finally got underway Saturday under her own power. More than a thousand U.S. Navy sailors were joined on board by hundreds of officials and workers from Naval Nuclear Reactors, Naval Sea Systems Command and Newport News Shipbuilding as the ship, which when completed will displace about 100,000 tons, moved into Hampton Roads and out to sea to begin the first of a series of sea trials. It was a long-anticipated event for the $13 billion, next-generation aircraft carrier, which has been delayed as the Navy and its contractors worked out numerous technological glitches. The ship is the first of a new class of aircraft carrier and features a number of major improvements and changes over the previous Nimitz-class design. The Ford has been in the planning and construction phases for more than a decade, beginning with the first contract award in May 2004. Steel was first cut in August 2005, and a keel-laying ceremony was held in November 2009. 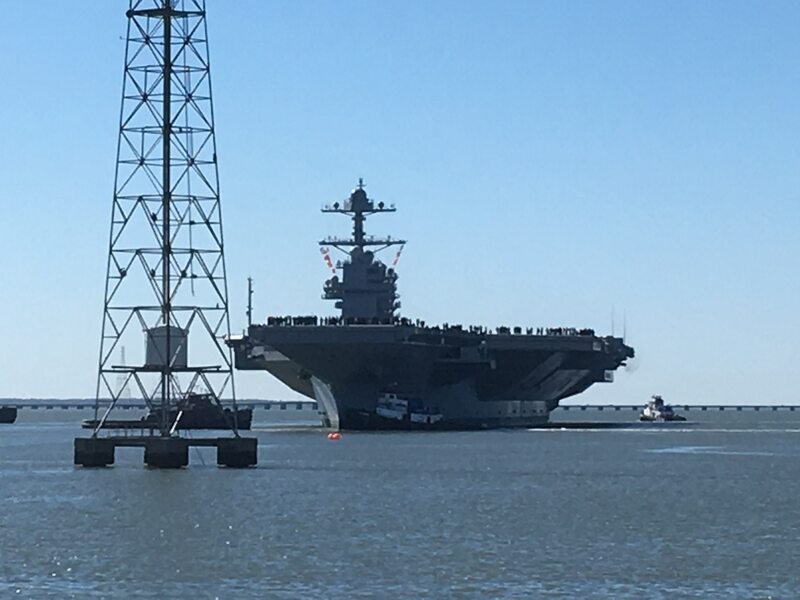 Built in a huge graving dock at Newport News capable of holding two of her kind, the aircraft carrier was first floated in October 2013 and christened by Susan Ford, daughter of namesake President Ford, on Nov. 9, 2013. The ship was first planned to join the fleet in 2014, but construction was slowed by a number of issues, many associated with first-of-class problems that included tuning new-design nuclear reactors and a much more capable electrical power installation. The ship’s delivery date has been pushed back several times, and last year, the Ford’s electricity-generating main turbines were found to have mechanical problems, resulting in another delivery delay. More than 900 sailors moved on board the Ford in August 2015 to begin training to take the ship to sea, which was expected at that time to take place in early 2016. The sailors have remained on board since then despite continued delays. Most recently, Sean Stackley, now acting secretary of the Navy, said in January that builder’s trials would be carried out in March, with acceptance trials and delivery in April. While the March date was missed, a Navy official on Thursday said the service still hopes to complete both builder’s and acceptance trials in April and take delivery of the ship by the end of April. A commissioning ceremony, marking the point when a ship formally enters naval service, is expected later this year, although a date has not been announced. The builder’s trials are expected to last just a few days and are to test out the ship and its systems – hull, mechanical and engineering systems – and not aimed at aircraft operations. Officials have long said that – as is the case with all new aircraft carriers – flight operations and full testing of flight deck gear won’t happen until the after the Navy has accepted the Ford and commissioned it. That’s not to downplay the significance of the ship’s first underway period, though. By law, the Navy is required to maintain a fleet of 11 aircraft carriers, but an exception was granted in 2012 so the Navy could decommission the aging Enterprise, the first-ever nuclear-powered aircraft carrier. Ironically, the Enterprise remains at Newport News, stored in the dry dock in which she was built, stripped of nuclear fuel and awaiting a final fate. Historically, the Ford’s departure marks the first time in 42 years the Navy has stretched the sea legs of a new class of aircraft carrier. The last time a similar event happened was March 1, 1975, when the USS Nimitz got underway from the same pier for her sea trials. She was accepted by the Navy just over a month later on April 11 and was commissioned May 3 of the same year. 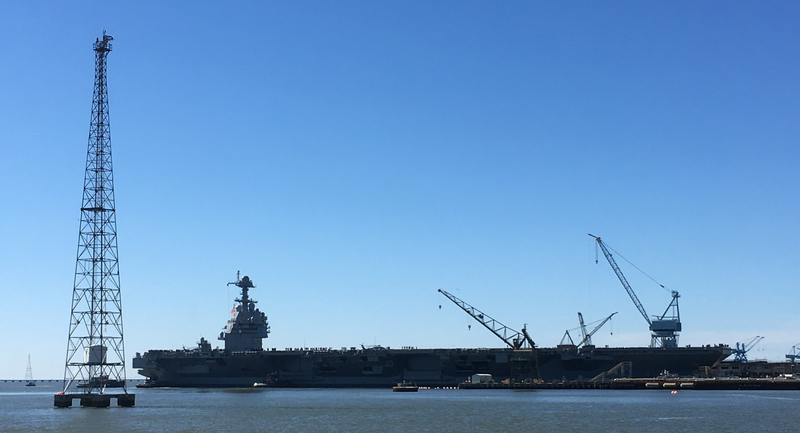 The Nimitz is now the oldest aircraft carrier in the fleet, and will likely stay in service until the John F. Kennedy, now under construction at Newport News, joins the fleet. A keel ceremony for the Kennedy was held in August 2015, and the most recent Navy documents show a delivery date of 2023. A third ship of the class, a new Enterprise, is also in the early stages of construction.